This doorway does not allow you to download personnel (other than Dr. Telek R'Mor) or give permission to play a card. It provides a destination for reporting a personnel (e.g., one played as your normal card play, or downloaded with another card that does not provide a destination, such as the last function of Defend Homeworld). The allowance for a personnel to mix with your other affiliations “for rest of game” applies only to the copy of the personnel you reported aboard your ship (not to additional copies or other versions of the persona). If that copy leaves play, the effect does not apply to the same or another copy of the card reported again normally. See once per game. If you download Dr. Telek R’Mor with this doorway, you may use the doorway’s text to report him aboard any of your ships and allow him to mix with all your affiliations (discard the doorway), or his own text to report him aboard your compatible ship without “mixing” permission (do not discard the doorway). 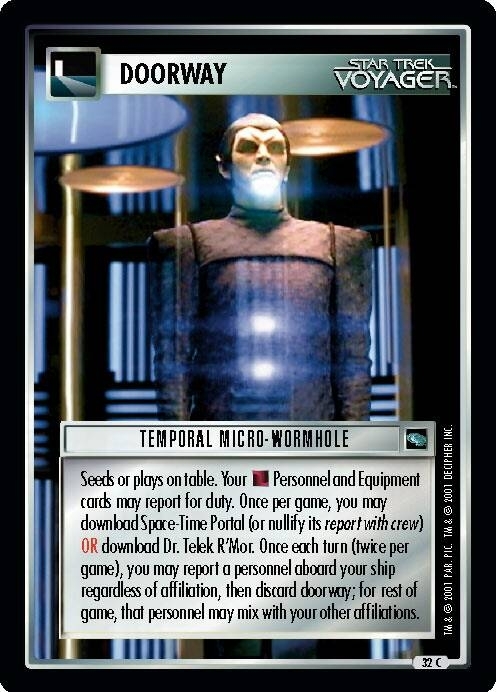 There are 18 entries for Temporal Micro-Wormhole (ST1E 12 C 32) at the Tradeplace (44 haves and 3 wants). Click here to see all trade list entries for this Common card!